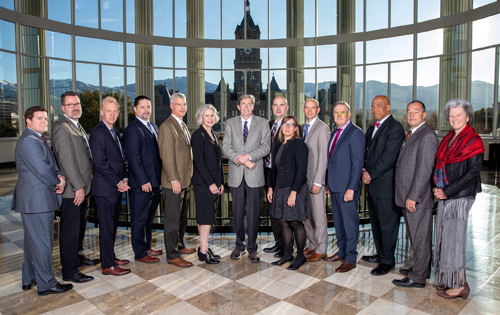 The Utah State Court System is comprised of two appellate courts - the Supreme Court and Court of Appeals; trial courts including the District, Juvenile, and Justice Courts; and two administrative bodies - the Judicial Council and the Administrative Office of the Court. District, Juvenile and Justice courts are located in each of the state's eight judicial districts. If you are uncertain of which district you live in, use the Judicial District Locator Map. The links below provide more information about the court system. Visit the Judges' Biographies to learn about the judges in each court. Then find out how judges are selected and their performance is evaluated. The Code of Judicial Conduct and judicial ethics opinions guide the conduct of Utah's judges. Click here to review the Code of Judicial Conduct and judicial ethics opinions. The Judicial Conduct Commission exists to review complaints alleging unethical conduct of judges. Click here for more information. Mac Users: Download the Windows Media® Components for QuickTime (provided by Flip4Mac™) to view "The Judges" video. The Utah Judicial Council is the policy-making body for the judiciary. It has the constitutional authority to adopt uniform rules for the administration of all the courts in the state. The Council also sets standards for judicial performance, court facilities, support services, and judicial and non-judicial staff levels. The Council consists of fourteen members. The Chief Justice of the Supreme Court chairs the Council. The other members include: a Supreme Court Justice; a judge of the Court of Appeals; five District Court judges; two Juvenile Court judges; three Justice Court judges; a state bar representative; and the State Court Administrator, who serves as secretariat to the Council. The judges serve three-year terms, and the state bar representative also serves three years. List of current Judicial Council members. The Judicial Council holds monthly meetings throughout the state. All the meetings are open and may be attended by interested parties. They provide an opportunity for other branches of government, federal agencies, and citizens to present issues and concerns directly to the judiciary. By rule, the Judicial Council established a Board of Judges for each level of court. Boards of Judges adopt administrative rules in accordance with the guidelines of the Council, advise the Council, supervise the implementation of Council policies and serve as liaisons between judges and the Council. The Court Administrator Act, passed in 1973 and revised in 1986, provides for the appointment of a State Court Administrator, an individual with professional ability and experience in the field of public administration and an understanding of court procedures and services. The State Court Administrator is assisted by a Deputy Administrator, District, Juvenile, and Justice Court Administrators, trial court executives, and management personnel in the following areas: Human Resources, Public Information, Planning and Research, Finance, Information Technology, Information Services, Audit and General Counsel. The Administrative Office of the Courts serves as staff to the Judicial Council, rules committees, boards of judges, standing and ad hoc committees, and nominating commissions and provides support to Clerks of Court and Trial Court Executives throughout the state. The Utah State Archives website includes histories of the courts in Utah. Click here to see what is available.